Home > Hallmark MAGIC Ornaments > Hallmark Magic Ornaments (2009 - 2011) > 2011 Hello, Snow! *Press the button to see the lantern light up and hear music from the Christmas classic "Let It Snow." On base of ornament: "So much Christmas wonder to discover." 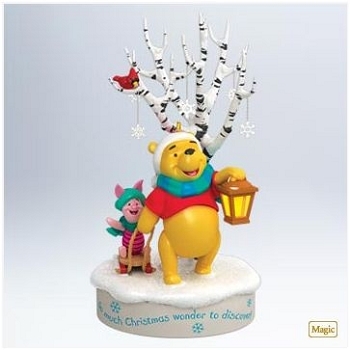 This 2011 Hallmark Disney Ornament was originally offered as a Hallmark Gold Crown store exclusive. Size: 2½" x 4½" x 2¼"